All of the different designs in the Applewood series of small pole-frame horse barns, garages, storage barns and workshops can be built from the same set of plans. You'll receive detailed construction drawings for an open plan, 20'x24' all purpose Main Barn with big sliding doors and a 20'x24' storage loft. 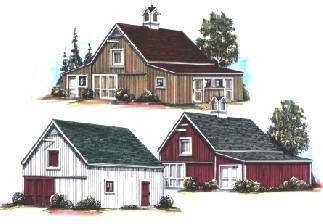 You'll also receive plans for a variety of optional sheds that can extend the Main Barn on either side. Build the 20'x24' barn now. Then add up to six horse stalls, a garage or tractor shed, a workshop, a tack room and open shelters for grooming areas, run-ins or storage. Build little-by-little as your needs grow, or build exactly the layout you want right away. You can customize your barn or garage with your choice of layouts and your selection of exterior materials. Blueprints, by architect Don Berg, include all the drawings you'll need to build any of the twenty-five layouts shown on the plans, or you can create your own custom building layout. Areas: Floor Area of Main Barn - 480 Sq. Ft., Floor Area of Storage Loft - 480 Sq.Ft. Add-On Sheds: Sheds are 10'x24' (240 Sq.Ft.) and 12'x24' (288 Sq. Ft). They are designed for use as additional stalls, open shelters, run-ins, carports, garages, tractor shelters, workshops, garden sheds, open equipment shelters and woodsheds, and are planned to be easy-to-build on either side of the Main Barn. They may be built at the same time as the main barn, as shown in the various sample designs, or added later as your needs grow. Doors: The sliding doors on the front and back of the Main Barn are each 9'-6" wide and 9' high. Dutch doors on the optional horse stalls are 4' wide by 7'-4" high. The garage doors on the add-ons open 8' wide and 7' high. Overhead doors may be substituted for all sliding doors and hinged doors shown on the plans. Construction & Finishes: These barns, garages and sheds are designed to provide you with inexpensive parking and storage space, the look of traditional country outbuildings and the best quality modern construction. All of the materials shown on the website illustrations are just suggestions. These buildings can be constructed with any of a variety of exterior finishes and details so that they can match your home or other buildings on your property. Architect Don Berg's designs, interviews and articles have appeared in Home Magazine, Traditional Building Magazine, The Old House Journal, Better Homes and Gardens, Country Magazine, Equine Journal, Country Extra, Yankee Home, Hudson Valley Magazine, Period Homes Magazine, Mother Earth News and many other publications. He's been a guest and consultant on HGTV and has published fifteen books on traditional American country building and landscape design. Since the drawings are for horse shelters and storage spaces, they don't include details for insulation, interior finishes, electricity or plumbing. If needed, these can be added by a local building professional. Order Now: Plans are $59.00 plus $5.00 for shipping, for three complete sets of drawings. The plans come with a complete money-back guarantee and include a variety of optional add-on sheds, garages, shops, horse stalls and open shelters that help you build any of twenty-five different standard layouts including what's shown above. All twenty-five standard layouts are shown on the plans. You can build any of them, or you can use the main barn/garage plans and any of the add-ons to create your own custom design.